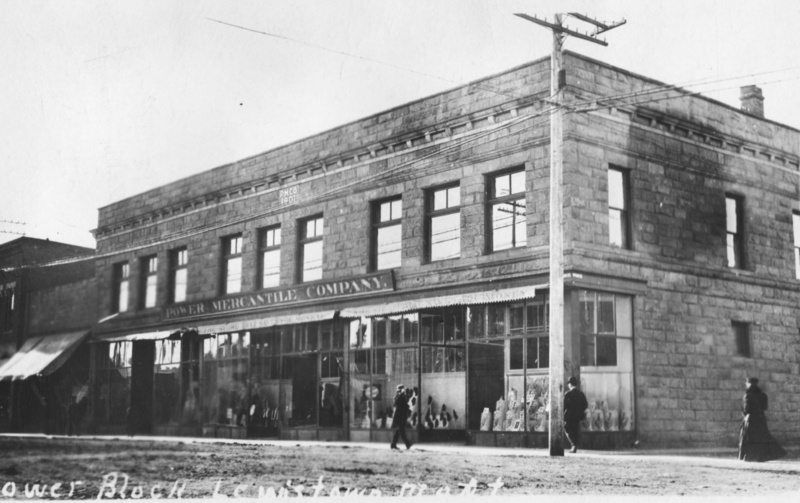 The Power Mercantile building (Reid’s) was built in 1901 at 302 W. Main. “Work is progressing rapidly on the Power Mercantile’s new building and the foundation is almost completed. The original 15 windows in the front of the second story have been changed and nine large windows with a lower sash 60 X 54 substituted. Owing to the fact that the city waterworks will be completed inside of the year the original intention of furnishing the water supply by a reservoir has been abandoned and all sanitary plumbing and toilet faucets will be laid with the intention of making connections with the city water mains as soon as they are in position. The foundation of the building is particularly solid, concrete piers having been placed in position for the main supports of the building to rest upon. Heavier iron and timbers of larger dimensions than was at first planed will be used for supporting purposes in order to enable the building to be raised two stories in height if it is felt necessary at any future time. The sidewalk in front of the building will be of steel overlaid with cement and will have heavy glass lights which will assist in lighting up the basement.….. the entire 90 foot front will be a complete line of magnificent plate glass show windows….convenient toilet rooms will be situated in the west end of the big salesroom. Elevators will be placed in position and all the appurtenances of the building will be strictly first-class.” (Fergus Co Argus 10-21-1901). “Charles Sturman arrived from Benton last Saturday with two freight teams loaded with plate glass to be used both in the Power Mercantile Company’s new store and in the Lewistown Commercial Company’s building.” (Fergus County Argus, Oct 30, 1901). “Senator Power advises building the Power Mercantile Company’s store four stories high. Manager Symmes says that owing to the difficulty experienced in obtaining the necessary building materials at present, he is rather averse to altering the plans now as it would delay the occupation of the building…” (Fergus County Argus Dec. 4, 1901). “The ceiling which had been delayed in the East is now on its way…” Apr 16, 1902. 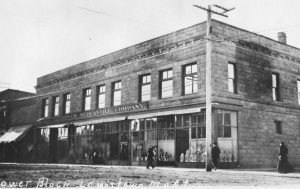 “The Power Mercantile Company….two stories in height with a front of 95 feet and depth of 90 feet; constructed of the best dressed sandstone found in the excellent quarries of this section…. 6 large arc lights illuminate this floor. ….the large posts dividing the different departments are painted purest white, with the daintiest border of gold…..At the rear center of the lower floor a wide oaken stairway ascends to the upper floor. …a complete system of the new “Air Line Cash Carriers” reach the cashier’s office from all parts of the store…. a shaft for an elevator is arranged in the rear of the grocery department. (Fergus Co. Argus, 7-2-1902). In 1908 an addition was added to the back which extended to Broadway Street. Interesting historical note: “The stockade built by Francis Janeaux stood partly on the present site of the Power Mercantile Company’s building and partly between that building and the Judith Hardware store. While excavating for the foundations of the Power building last year traces of this stockade were found.” (Montana Daily Record, Nov. 21, 1903). To the left of the original building was McKechnie’s Drug Store (building with the awning) which was later added into the original building. The Bon Ton is on the far left side.